I served as Chairman of Health & Genetics for the English Setter Association of America (ESAA) for over a decade. Jane Wooding and I launched the ESAA BAER Database for Deafness – now the largest BAER Database for one breed in the world. 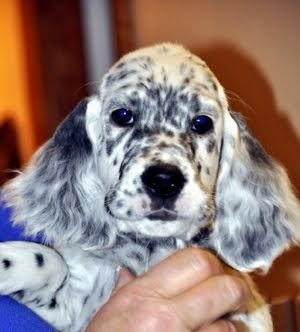 I initiated the English Setter Donor Advised Fund for research housed at the Canine Health Foundation. I made recommendations to the ESAA Board on which research projects should receive financial support from our Donor Advised Fund. I guided ESAA in joining the AKC CHIC program (Canine Health Information Center). My committee recommended acceptable health screening tests for our breed. I’m a Charter member of the Kettle Moraine English Setter Club (based in SE Wisconsin) and have held every officer’s role at some time. I get ALL the puppies I breed checked for health issues when they reach 2 years old. This means ALL puppies in a litter - not just those placed in homes where they will be bred. All of my personal breeding stock is tested for Hip Dysplasia, Elbow Dysplasia, Congenital Deafness, and Hypothyroidism. All results are posted on the Open Registries at OFA (www.offa.org). Nearly every dog I breed is free of the four common health problems. I aim to improve the health of the Linwood dogs with each generation I produce. My most important requirement is that you have a loving home and want a dog to be your friend. My dogs are not suited to living outside in a kennel day and night. My puppies are raised in my house and make special family companions. I go to great lengths to socialize them so they will be well-adjusted dogs. They belong in the house WITH YOU. My dogs need a safe place outside to run and play every day. A yard with a 4ft+ fence or electronic fencing is a MUST. English Setters should not be trusted to stay in a yard without tangible boundaries. I require that you do hip & elbow xrays and submit them to OFA's Open database (the Orthopedic Foundation for Animals) soon after your dog turns two years old. I require that you check your dog for thyroid disease & submit it to OFA's Open Database when they are two years old. I recommend rechecks periodically after that. This is a common problem in our breed. -Each puppy leaves my home healthy. -Each puppy has had their first set of shots. -Each puppy has had a microchip placed & registered for permanent identification. -Each puppy has had their hearing checked with the BAER test. I send all the results to the ESAA BAER Database. -Each dog I place of any age is healthy and has a stable temperament. -I will openly share the health clearances for every dog I place. -I am willing to share the health clearances for the parents & relatives of every dog I place - remind me if I forget. -I am willing to be a resource for the owners of my dogs throughout the dog’s lifetime.